Retail Sales In the Euro Area increased 2.9% in July of 2016 over the same month in the previous year, better than a 1.7 % rise in June and beating expectations of a 1.9 % gain. Retail Sales YoY in the Euro Area averaged 1.04 % from 1996 until 2016, reaching an all time high of 5 % in November of 1998 and a record low of -4.60 % in February of 2009. In July 2016 compared with July 2015 the calendar adjusted retail sales index increased by 2.9% in the euro area and by 3.5% in the EU28. 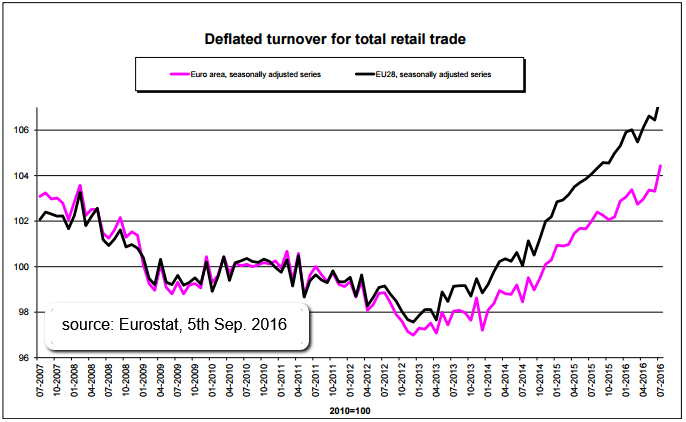 The 2.9% increase in the volume of retail trade in the euro area in July 2016, compared with July 2015, is due to rises of 3.2% for non-food products, of 2.2% for automotive fuel and of 1.8% for "Food, drinks and tobacco". In the EU28, the 3.5% increase in retail trade volume is due to rises of 4.3% for non-food products, of 3.8% for automotive fuel and of 2.2% for "Food, drinks and tobacco".